MARTINEZ, CA – The City of Oakland, CA made its announcement on Oct. 5, when the first of its vehicles filled up with NEXDIESEL renewable diesel during a gathering of the Public Works Department and its supplier Golden Gate Petroleum, the largest distributor of NEXDIESEL in the Western United States. The partnership between the City of Oakland and Golden Gate Petroleum to bring NEXDIESEL renewable diesel to the city’s diesel-powered fleet will mutually help Oakland meet its commitment to become one of the top cities in the US committed to reducing its carbon footprint. By switching to renewable diesel, Oakland paves the way to reducing emissions and meeting California’s Greenhouse Gas reduction mandates. Oakland’s Fleet of 250 diesel-powered vehicles and equipment are now running on renewable diesel, equating to over 230,000 gallons of usage per year. This is a significant reduction in the use of petroleum diesel. “Golden Gate Petroleum is extremely pleased to supply NEXDIESEL renewable diesel to Oakland’s Fleet. Oakland is the first major US city to convert their entire diesel fleet to this sustainable fuel. Oakland is a true leader in taking steps towards reducing emissions and should be commended for their efforts in taking steps to improve air quality and combat climate change,” said Pat O’Keefe, Vice President of Golden Gate Petroleum and CEO of NEXGEN Fuel. 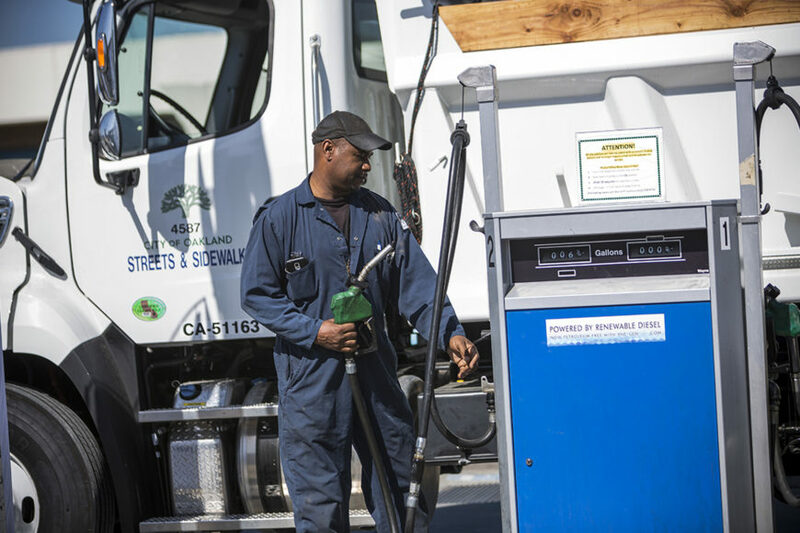 For the past two years, Golden Gate Petroleum has been distributing and making this fuel available to both public and private fleets in California. Renewable diesel has the same chemical properties as petroleum diesel and it also meets the petroleum diesel specification ASTM D975, allowing fleets to seamlessly switch without additional investment or engine modifications. In addition, renewable diesel burns cleaner, leading to less maintenance costs and reduced emissions. Golden Gate Petroleum, a 69-year-old petroleum and biofuel distributor, was one of the first to market Nexdiesel renewable diesel in the US, making the fuel available to commercial fleets throughout California in early 2013. Since bringing the fuel to market, Golden Gate Petroleum has converted many public and private fleets. Through their hard work and dedication in raising awareness of this sustainable fuel, Golden Petroleum is experiencing a dramatic increase in demand for renewable diesel. To date, Golden Gate has sold over 60 million gallons of this low-carbon alternative fuel making a tremendous impact on air quality throughout California. In 2015, NEXGEN Fuel was formed by Vice President of GGP, Patrick O’Keefe. NEXGEN’s mission is to identify and bring next-generation alternative fuels to the marketplace. NEXGEN’s first fuel is NEXDIESEL Renewable Diesel. Golden Gate Petroleum was founded in 1946 and is one of the largest petroleum and biofuel distributors in the Western United States. Golden Gate first started distributing alternative fuels in 1996 and became the first US distributor of NEXDIESEL Renewable Diesel in 2013. Learn more at ggpetroleum.com. NEXGEN Fuel is a new fuel brand dedicated to distributing and marketing the highest quality, next generation fuels to private and public fleets, consumers and environmentally conscious organizations. The first NEXGEN fuel to be offered is NEXDIESEL Renewable Diesel, a superior quality diesel fuel. Learn more at www.nexgenfuel.com. The City of Oakland is recognized as one of the leading local governments in addressing climate change challenges. The city has adopted ambitious greenhouse gas reduction goals through its Energy and Climate Action Plan, which includes reducing emissions from governmental operations by 36 percent by 2020. Oakland has received more than 30 recognitions for its advances in sustainability over the past 10 years and is a signatory to multiple climate accords at state, national and international levels.